A smooth trade quality emulsion, with excellent coverage, gives a good even appearance on interior walls and ceilings. Easy to apply, fast drying and provides a flat, non-reflective modern finish. Approximate coverage of 16m2 per litre. 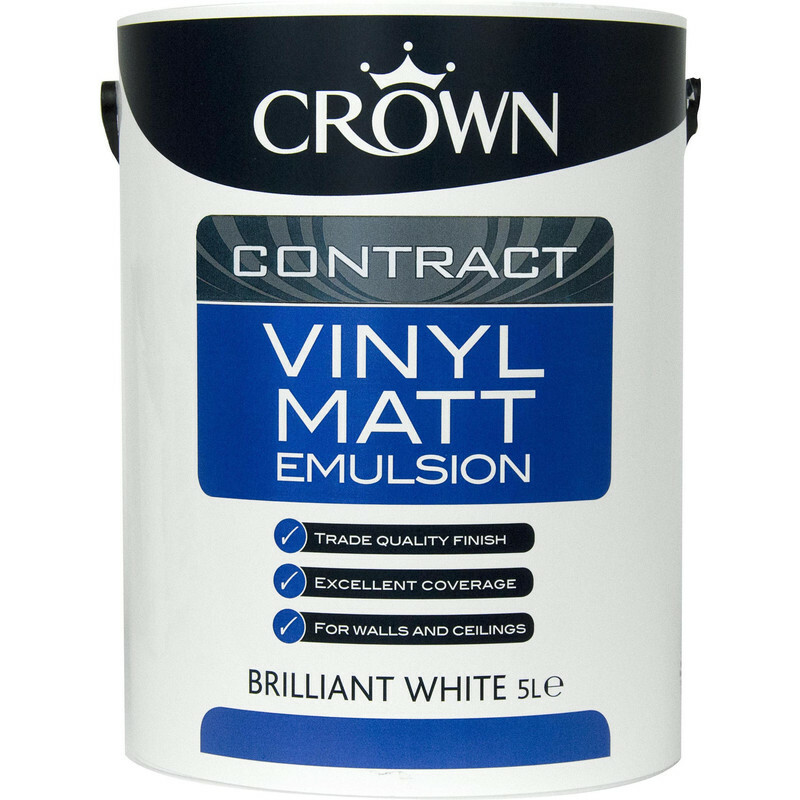 Crown Contract Vinyl Matt Emulsion Paint 5L Brilliant White is rated 4.1 out of 5 by 14. Rated 4 out of 5 by ParkyN from Magnolia Good - Brilliant White not so brilliant I needed two tins, but the store only had one, so I got another can of Magnolia sent to the store (by Parcel Force). Lucky I opened the package before leaving - it had leaked in transit. By now there was more stock in, so it was swapped immediately. Having used both the Brilliant White and Magnolia, I love the coverage of the Magnolia, but hate the White. Despite the white being a much thicker paint, it's so far taken three good roller coats and still dark patches show up from beneath, especially where One Strike filler has been used.. No problems with the equivalent Magnolia. Rated 3 out of 5 by ChrisG57 from smell lingers I used this on a bedroom ceiling whch had previously been painted the same colour. Application seemed okay and the smell seemed normal for emulsion paint at the time of painting. However, it´s been more than a week with windows mostly open and the fumes are still lingering. Rated 5 out of 5 by 2me2u from Good coverage Given up buying cheapo emulsion because the coverage can never be guaranteed. This Crown paint gives excellent coverage and good results every time. Rated 3 out of 5 by WeLoc from Nice paint but leaking on delivery.......... Sadly first impressions not good, with a soggy box being delivered by Parcelforce. Upon opening, the lid had popped up and some of the paint leaked inside the bag. No reply from Toolstation helpline but full marks in the end for reponding to an email with photos the next day, credit received - a bit mucky, maybe I was unlucky. Rated 5 out of 5 by arthur71 from Good coverage, nice and bright Have painted the ceilings white - good coverage and looks lovely. Appreciate ToolStation's free delivery for orders over £10 since I don't have a car and delivery costs from some companies are extortionate. Rated 4 out of 5 by Jon57 from Great paint This paint represents great value for money, out performing more expensive paints in many aspects.